In the mid 1860s when Oliver Hudson Kelley, an employee of the department of agriculture, toured the South he was appalled at the farming practices he found there. Many farmers were using techniques that were far outdated, and even harmful to the soil. In 1867 Kelley, with six others, founded the National Grange of the Patrons of Husbandry. The organization was originally founded with the idea of educating and connecting farmers within America. The first Grange was set up in Fredonia, New York. From there granges spread across the U.S., providing classes and social events to farmers. The first Kansas Grange was organized in 1872 at Hiawatha. Within a few years, more than 1,000 Granges claiming more than 30,000 members had been established across the state. At first granges were important because of the social outlet they provided rural farmers. Many farmers lived isolated from others, and were unable to socialize except on Sundays for church, and on market days. By attending Grange meetings farmers came together to socialize and discuss their area issues. It wasn’t long before the grange made a move toward political involvement. By being a connected force farmers gained more say in what laws were needed to support agriculture. The Panic of 1873 found farmers facing all time lows in prices for their crops. Laws known as “Granger laws” were put in place to help farmers. The biggest competition the grange faced was railroad companies. These companies fought the new laws, which cut into their profits. 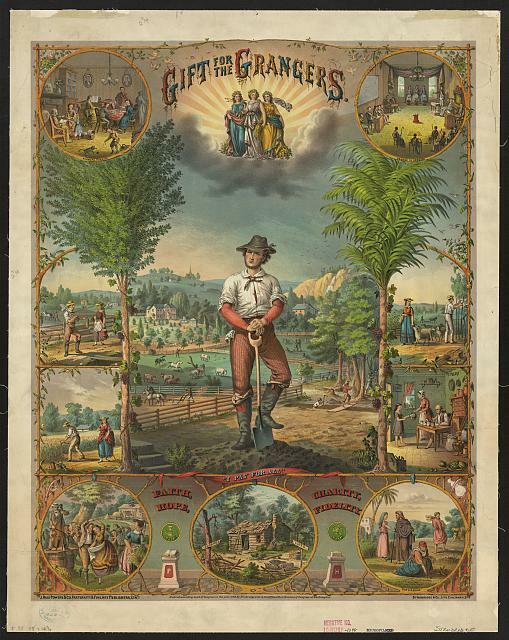 During the 1870s grangers began many programs that have become commonplace in American farming today, but at the time were new concepts. Farmers began pooling their savings, so they could avoid risky bank loans, thus starting one of the first credit unions. They stored their grains in community elevators, so it could be safely protected until prices increased. They also purchased equipment as a group, so as to receive bulk pricing. These practices were instrumental in strengthening American farmers and creating the modern farming industry. The grange was a unique organization of the time due to its acceptance of female members. Mary Elizabeth Lease of Kansas was one of the nation's first female attorneys and a member of the grange. She traveled to grange halls across the U.S. and urged farmers to "raise less corn and more hell." This was a plea to farmers to reduce their production, as over production was causing a drop in prices. While the National Grange of the Patrons of Husbandry still exists today, it fell out of popularity after 1880. Today it offers mostly social and educational events.